Powerful and intelligent! WEIMA presents the PowerLine 3000 at the world's leading trade fair, IFAT 2018. What a success! WEIMA recently presented at IFAT, the “leading trade fair for environmental technologies” (source). 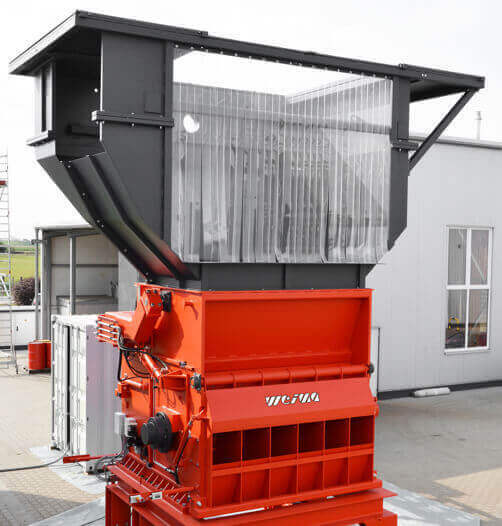 Know-how from water, sewage, waste and raw materials management is the focus here – the perfect setting to present the universally applicable single-shaft shredder. The world-renowned trade fair boasted over 141,000 visitors from over 160 countries (source). The PowerLine 3000 is one of the largest and most powerful shredding machines of the machinery manufacturer from Ilsfeld. It not only shreds commercial waste, industrial waste, bulky or household waste, but also paper, wood residues or carpet materials. As a single-stage operation or as part of a plant, it accepts a wide variety of input materials, including contaminated substances. The highly efficient single-shaft shredder shreds almost any waste. After sorting out materials that are not suitable for RDF, the pre-shredded material can be processed perfectly in the secondary shredding process and ensures an optimum result in the extraction of valuable secondary raw materials. Intelligent and energy-saving disposal technologies play an important role at WEIMA and are more in demand today than ever before. The new swing arm technology, which is located in the cutting chamber, works significantly faster and requires considerably less work. The advantage here is the optional secondary feeding system for materials with low bulk density. Another significant feature is the optimized design. This means that the swing arm can be extended upwards from the machine frame, greatly simplifying accessibility and making maintenance easier. The high degree of individualisation continues with the adaptive design of the base frame. Direct filling takes place via an optimally designed low loading edge by conveyor belt, gripper or directly via wheel loader and is therefore easy to operate. Another outstanding feature is the outward-opening, swivelling screen basket for optimum and safe maintenance work. The multi-part screen inserts are freely exchangeable inside and outside. 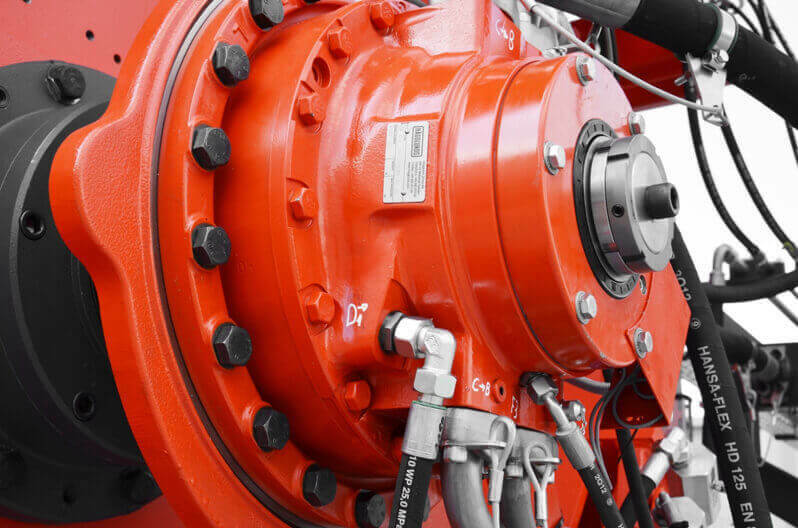 Depending on the application, two different drive concepts can be selected – the hydraulic drive or the torque drive, which is equipped with a safety clutch. Wherever highly contaminated material is to be shredded, hydraulic drives have the decisive advantage: Since they do not have a classic gearbox that is subject to wear during impacts, they are quicker to react and less sensitive to impurities. If a high cutting force is required, the hydraulic drive works just as efficiently. Since the rotor speed is infinitely variable, the shredder is optimally adjustable to the material to be shredded. Stopping, starting, and reversing is possible at any time and under full load, even under the most difficult conditions. The robust drive impresses with extremely high torques and low connected load. With higher throughput, less electricity is required and this has an immense impact on operating costs. The PowerLine 3000 can optionally be equipped with a torque drive plus safety clutch. An attractive feature here is the high torque at medium speed. The safety coupling protects the shredder from impurities and major damage. The frequency inverter ensures optimum speed adjustment. The advantages of the torque drive are low investment costs and user-friendly maintenance options. In order to achieve a more aggressive material feed, WEIMA has mainly dedicated itself to fixed knives. They are mounted in an inclined position. Both the lower and the upper counter knives can be adjusted from the outside using adjusting screws. An optimum cutting gap can thus be achieved in a short time. The PowerLine rotor also scores with an extremely high throughput capacity and low energy and maintenance costs and is designed for the toughest requirements. WEIMA is the complete supplier for the single and multi-stage treatment of waste and is looking forward to IFAT 2020.